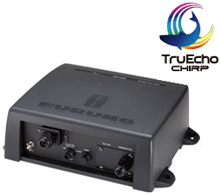 And as by magic – Furuno published details on their Chirp blackbox sounder today. The Furuno DFF1-UHD is a 1 kW Chirp blackbox sounder compatible with Furuno NavNet TZtouch and NavNet 3D. The DFF1-UHD requires TZtouch and NavNet 3D to get software updates. The TZtouch software update is planned for spring 2013 where the NavNet 3D software update timing has not been announced.